The pace is fast here at Abu Dhabi Sustainability Week — panels, press conferences, announcements, round tables, interviews, and more presentations. For an inexperienced rookie journalist like me, it feels like a rollercoaster. 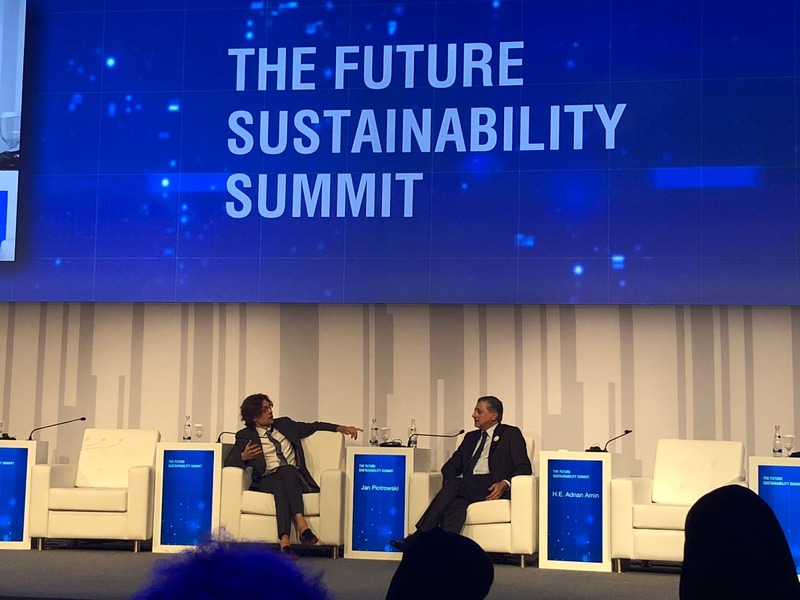 Thank God the rollercoaster stops from time to time, and today it stopped for me with a roundtable interview with Bader Al Lamki, Executive Director of Clean Energy at Masdar*. It was an excellent atmosphere — just a small group of colleagues, who had already had a few dinners together, plus quiet surroundings. There was a general feeling of being detached from the noise and hustle outside. One of many exciting plenaries — IRENA Director General until a few days ago, Adnan Z. Amin. Being the end of the day meant Bader Al Lamki had had several interviews and meetings behind him and seemed to hope for a few quick and easy questions. That is not what we held for him. My British colleague fired first to ask Bader’s opinion on the geopolitical transformations IRENA presented the previous Friday. It was great to see how Mr Al Lamki straightened, smiled, and switched into a focused mode without losing his natural friendly approach he is so famous for. As for geopolitics — no wonder Masdar is optimistic about the changes looming on the horizon. The company has been preparing for the change for years. It also realizes the pace of transformation is not going to be consistent all around the world and that it is important to jump on this train now. I kept pushing Mr. Al Lamki a little more by questioning the UAE’s interest in distributing renewable technologies, allowing other countries to enjoy independent and democratic energy systems. I also made reference to the IRENA report to see if the real and obvious objective is to exchange oil dominance with technology dominance of a few countries (quoting from the Masdar website “Masdar’s mandate is to help maintain the leadership of the United Arab Emirates (UAE) in the global energy sector”). Mr Al Lamki’s reply left no doubt, Masdar’s operations are business oriented. However, the fundamental difference today is that technology is shared more openly and the future will mean closer cooperation, including grid interconnections for countries to build a reliable network. After the example of the UAE selling energy to Europe through a smart grid, we also agreed it could, and probably will, work both ways — making the relationship more bilateral than it is in case of fossil fuels. At that moment our colleague from Bahrain stepped in to find out more about Masdar’s investments in the region. The list could probably go on for a long time. Mr. Al Lamki seemed to be determined to name them all, including the recent announcement of the 400 MW wind farm in Saudi Arabia, 100 MW solar PV projects in Bahrain, or an early 50 MW wind project in Oman. So, Mr. Bader Al Lamki, how big is your portfolio today? “4GW and growing.” That’s 4 gigawatts. How about your next steps, what are your goals, Mr. Al Lamki? What follows is a smile and a swift statement: “Our goal is to double that in the next 5 years.” The first 4 GW took a decade since Masdar was established and it will speed up now to reach the same capacity additions in just 5 years. If that is not “delivering on the global sustainability agenda,” then what is? We will write more here on CleanTechnica about what partnerships have been established and what new investments have been made all over the world, reaching far beyond GCC countries to Europe, the US, and Latin America. There will be plenty of good cleantech news coming from that source* (pun intended). Just a teaser for my next article, which includes insider knowledge.